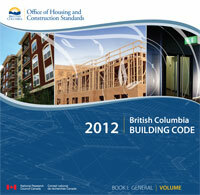 Changes to the BC Building Code occur periodically. All design and construction of building permit applications received will be required to comply with the 2012 code and its updates..
For convenience we are providing PDF documents outlining some of the more recent code changes. Please click on the link below to open these printable documents. This may not be a complete list of updates. For more information on how to obtain the BC Building Codes (Building, Fire, Plumbing) click on the link below.